The Association of Handcraft Printers NZ was founded in 1974 and is made up of people interested in the practice of letterpress printing and all that is entailed in the craft – from the machinery, some of which has needed to be refurbished after lying unused for many years, to the skilled operating of the equipment, often by men who served long apprenticeships to learn their trade and have much to teach those who are interested in learning the skills and thrill of printing traditional letterpress. There are also those who love letterpress for its tactile nature, the quality of the paper and the beauty of the impressed ink. Whatever your connection to the world of letterpress, you are welcome to join us in the appreciation and practice of letterpress printing. More recent innovations such as polymer plate printing, embossing and debossing, and paper crafts such as bookbinding and papermaking are becoming part of the letterpress family. Members receive regular newsletters, the biannual Vinculum, an A5 booklet of printing examples submitted by members that reflect the skill, ingenuity, and interest of the printer. Since 2015 members have been invited to contribute a ‘month’ to the AHP calendar. These are distributed to every financial member as part of their subscription. 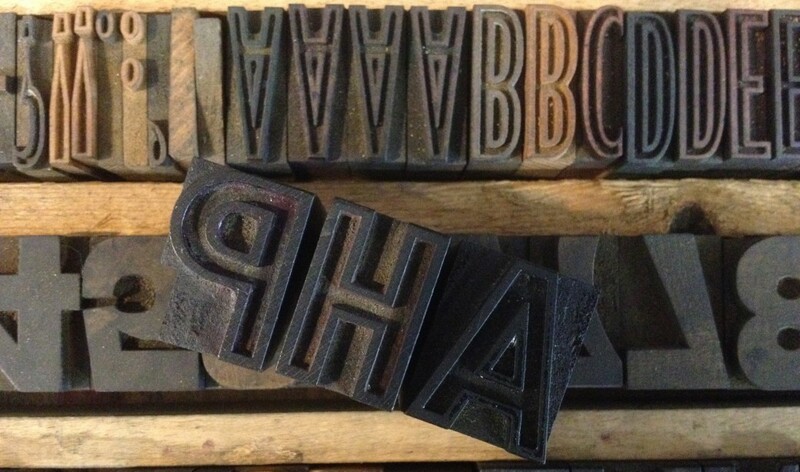 AHP’s membership is open to anyone interested in letterpress – we have members in the U.S.A., Canada, Australia and more than 80 in New Zealand. The subscription for New Zealand members is $NZ20 which is invoiced once your application is received. We will advise the subscription for overseas on application – it is largely based on mail costs.